The race announcer made some pretty good jokes about the weather and about the race not being cancelled and, with around 10 minutes to go before start time, even the most reluctant of runners started braving the downpour to make their way to the starting line. After I checked my gear (including my umbrella and my FuelBand) I stepped out from under the overhang I was hiding under and was almost instantly completely soaked. Surprisingly, it was a freeing feeling rather than an annoyance. I've never run in ran like that and it was nice to get to do it with 600 other surprisingly excited people. My full review of the Chinatown 5K is up at newcity.com. After the race I sat around in the rain for a while longer and then grabbed my gear and changed into a dry set of running clothes and jumped on the train to U.S. Cellular Field for the Ridiculous Obstacle Challenge (R.O.C.) 5K. It was still raining pretty hard when I got there and the starting waves were about an hour behind. There was a line stretching across most of the parking lot of U.S. Cellular Field - runners didn't seem to know that they were in waves anyway so the line was unnecessary. I talked to a couple of girls who drove in from Nashville and waited around for an hour and then decided to leave after lightning struck and the race was further delayed. I did get a good view of the first obstacle and it looked pretty fun (with the rain actually adding to the fun rather than detracting). But after waiting around for 90 minutes in the rain I decided that I wasn't going to make it past any further delays either so I left. I heard later that day from Erica that the race picked back up in the afternoon and she went back for a later start time and had a blast on the course. I would have stuck around longer to try to get a run at this thing but I had to review "The Qualms" at Steppenwolf that afternoon. If you got to run the R.O.C. 5K this weekend I'm jealous. 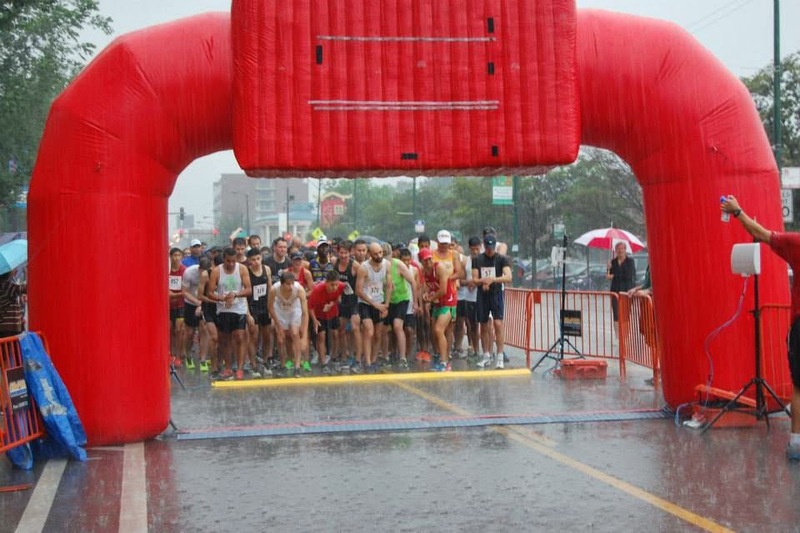 The Chinatown 5k looks like it would have been fun. Running in the rain is preferable to running in the heat/humidity. Once my clothes and shoes are soaked, then the rain doesn't matter too much any more and I can enjoy it. I ran in the Chinatown race ... it was a blast! My blog post will be published tomorrow AM (7/16/2014) if you want more info on it.